Remember when gigs mostly referred to music jobs or other cool, hippie-like short-term engagements? Investopedia defines a gig economy, as one where “temporary jobs are commonplace and companies tend toward hiring independent contractors and freelancers instead of full-time employees.” Many experts note we are in that economy with approximately one third of our workforce as independents per a recent NPR report. Last year CNN reported that that 44 million Americans make money outside of their job with side jobs. 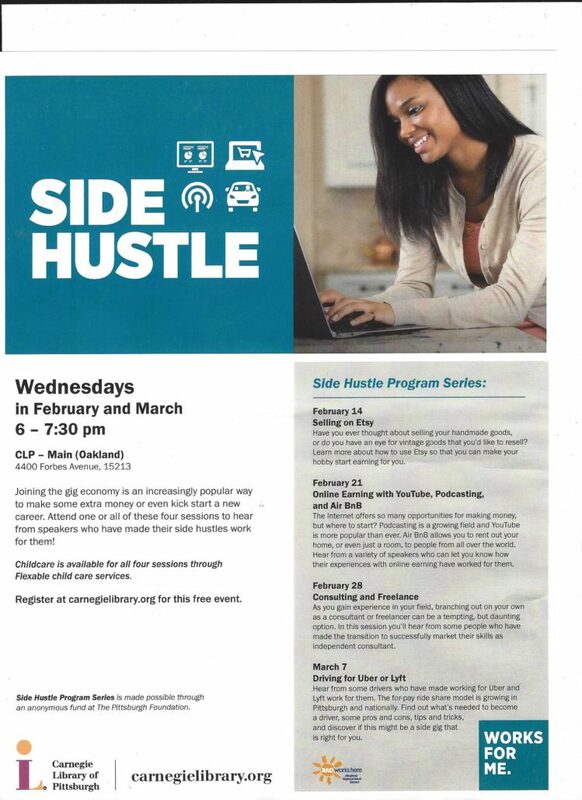 Read on for a new series sponsored by the Carnegie Library of Pittsburgh called “Side Hustle” featuring several gig economy programs. Sometimes a person chooses entrepreneurship or contract work for freedom and independence. Sometimes it’s a part-time gig to supplement retirement income or a low wage job with an employer. And sometimes it is all a person can get whether due to ageism, lack of skill or other barriers. Prudential conducted a research study which illustrated some of the plusses and minuses of the gig economy. The research showed gig worker income at $36,500 per year compared to $62,700 for full-time employees, but people were working a median of 25 hours per week as compared to 40. Maybe that’s why they are happy with their choice with only 19% wanting to move to a traditional work arrangement. Of boomers in the gig economy, 75% said they are “extremely satisfied with their work situation”. Click here for more on the research about the pluses and minuses of working in the gig economy. Click here for information on all four and to register. Copyright - Litzinger Career Consulting • Site built by and hosted by - In-House Graphics Inc.